I have no idea what the protocol is for naming versions of things. I imagine, like me, someone has an idea of what the stages are going to look like, when a truly fresh new is going to happen. For me I have a sense that version 4.0 of the SOLE Toolkit will incorporate what I am currently learning about assessment and 'badges', self-certification and team marking. But for now I'm not there yet and am building on what I have learnt about student digital literacies so I will settle for Version 3.5. This version of the SOLE Toolkit 3.5.1, remains a completely free, unprotected and macro-free Excel workbook with rich functionality to serve the learning designer. In version 3.0 I added more opportunities for the student to use the toolkit as an advanced organiser offering ways to record their engagement with their learning. It also added in some ability to sequence learning so that students could plan better their learning although I maintained this was guidance only and should allow students to determine their own pathways for learning. Version 3.5 has two significant enhancements. Firstly, it introduces a new dimension, providing a rich visualization of the learning spaces and tools that students are to engage with in their learning. This provides an alternative, fine-grain, view of the students modes of engagement in their learning. It permits the designer to plan not only for a balance of learning engagement but also a balance of environments and tools. This should allow designers to identify where 'tool-boredom' or 'tool-weariness' is possibly a danger to learner motivation and to ensure that a range of tools and environments allow students to develop based on their own learning preferences. Secondly, it allows for a greater degree of estimation of staff workload, part of the original purpose of the SOLE Model and Toolkit project back in 2009. This faculty-time calculations in design and facilitating are based on the learning spaces and tools to be used. This function allows programme designers and administrators, as well as designers themselves, to calculate the amount of time they are likely to need to design materials and facilitate learning around those materials. I invite you to explore the SOLE Toolkit on the dedicated website for the project and would welcome any comments of feedback you might have. 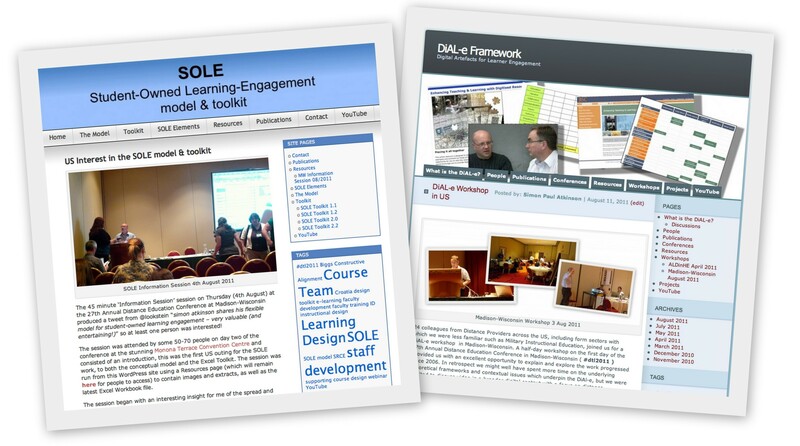 As promised this version of the SOLE Toolkit, 3.5, remain a free, unprotected and macro-free Excel workbook with rich functionality to serve the learning designer. Version 3.5 has two significant enhancements. Rich visualization of the learning spaces and tools: that students are to engage with in their learning. This provides an alternative, fine-grain, view of the students modes of engagement in their learning. It permits the designer to plan not only for a balance of learning engagement but also a balance of environments and tools. This should allow designers to identify where 'tool-boredom' or 'tool-weariness' is possibly a danger to learner motivation and to ensure that a range of tools and environments allow students to develop based on their own learning preferences. Faculty-time calculations in design and facilitating: based on the learning spaces and tools to be used there is now a function to allow programme designers and administrators, as well as designers themselves, to calculate the amount of time they are likely to need to design materials and facilitate learning around those materials. Predicated Workload – the amount of time the designer anticipates students will spend is on activities charted. Sequencing activities – the ability to suggest the order in which activities should be tackled. It remains an open approach and so the numbering system (letters, Roman, multiple instances of the same item) is open. It is considered important in the SOLE Model that students should take responsibility for the learning process as so the sequence should be suggestive or advised. Completion Record – a column has been added to allow students to record whether an activity has been completed alongside indicating the amount of time was actually spent on any given activity. Objectives Met Record – an area is included to allow students to indicate that they believe they have met the objectives for each individual topic/week. At its core the toolkit serves to implement a model of learning based on the SOLE Model itself and it is worth reminding yourself how the model is designed to work. Here are two short videos that detail the significant enhancement made in Version 3.5 of the Tookit. I think being able to visualise things is important. Faculty and learning designers need to be able to see Intended Learning Outcomes (ILOs) take shape and mant find existing lists are uninspiring. It’s not uncommon for faculty and instructional designers to get tired and weary of ILOs; they can feel restrictive, repetitive, formulaic and sometimes obstructive. In previous posts I’ve tried to suggest that the bigger picture, the challenges of effective 21st century university level learning design, make them not only useful, but also essential. If you don't agree, don’t bother reading. I’m not going to try and persuade you. If you think there’s some truth in the argument and you want to engage with ILOs to make your teaching more focussed, your students increasingly autonomous and your graduates equipped with meaningful evidence, then I hope I have something worthwhile sharing and will welcome your thoughts. I’m suggesting one SHOULD expect to see a different distribution of ILOs between the outcomes in these domains depending on the focus of the module and the level of study. One might expect to see a second year anthropology module on ‘theoretical perspectives’ emphasising cognitive outcomes and a module being studied alongside it on ‘research design and techniques’ emphasising affective and psychomotor outcomes. One might reasonably expect to see more foundational ‘knowledge and understanding’ outcomes in the first year of a programme of study, and more ‘cognitive’ outcomes at the end of the programme. The lack of this 'designed articulation' in many modules undermines their value to the student and ultimately to faculty. The basic principle is that an outcome should be assessable. Lots of great stuff can happen in your teaching and students’ learning that DOESN’T need to be assessed. It can be articulated in the syllabus, it just isn't a measured outcome. A student should be able, at the end of this course of study (module or programme), to evidence that they have attained the intended learning outcomes. This evidence has been assessed in some way and the student is then able to point to the ILOs amassed throughout their programme and say “I can demonstrate that I learnt to DO this”. There has been a significant shift in the language we now use from the original work in the 1950s by Bloom and colleagues. The passively descriptive language of Bloom's Taxonomy has become the active language of Anderson and Krathwohl (Anderson & Krathwohl, 2001). The taxonomies have moved from Evaluation to Evaluate, from Analysis to Analyse. This is significant in that the emphasis has moved away from describing what the focus of the teaching is supposed to be, to the demonstrable outcomes of the learning. The illustration above consists of four visual ‘wheels’ that I have used to discuss learning outcomes with faculty in the context of module and programme design at Massey University in New Zealand and at the LSE and BPP University College in the United Kingdom. These visual representations were inspired by work done elsewhere, on the cognitive domain in particular. The first documented example of this circular representation I have been able to find is attributed to Barbara Clark in 2002, but a great many people have since represented Bloom’s original, and the revised, cognitive domain in this way. The circular representation has the higher level terms at the centre, proto-verbs if you will, surrounded by a series of active verbs that articulate actions an individual might undertake to generate evidence, of their ability to represent to proto-verb. The circular visualisation also serves to create a more fluid representation of the stages, or divisions, in the proto-verbs. Rather than a strict ‘step-by-step’ representation where one advances ‘up’ the proto-verbs, one might consider this almost like the dial on an old telephone, in every case one starts at the ‘foundational’ and dials-up though the stages to the ‘highest’ level. Each level relies on the previous. It may be implicit that to analyse something, one will already have acquired a sense of its application, and that application is grounded on subject knowledge and understanding. So the circle is a useful way of visualising the interconnected nature of the process. Most importantly in my practice, it’s a great catalyst for debate. The circular representations of the domains and associated taxonomies also serve to make learning designers aware of the language they use. Can a verb be used at different levels? Certainly. Why? Because context is everything. One might ‘identify’ different rock samples in a first year geology class as part of applying a given classification of rocks to samples, or one might identify a new species of insect as part of postgraduate research programme. The verb on its own does not always denote level. I talk about the structure of ILOs in a subsequent post. More recent representations have created new complex forms that include the outer circle illustrated here. I’ve found these rather useful, in part because they often prove contentious. If the inner circle represents (in my versions) the proto-verbs within our chosen taxonomies, and the next circle represent that active verbs used to describe the Intended Learning Outcomes (ILO) AND the Learning and Teaching Activities (TLS), the outermost circle represents the evidence and assessment forms used to demonstrate that verb. Increasingly I’ve used this to identify educational technologies and get faculty thinking more broadly about how they can assess things online as well as in more traditional settings. The outermost circle will continue to evolve as our use of educational technologies evolves. In Constructive Alignment one might reasonably expect students’ learning activity to ‘rehearse’ the skills they are ultimately to evidence in assessment (Biggs & Collis, 1982; Boud & Falchikov, 2006) and the forms to enable that are becoming increasingly varied. One of my favourite representations of the relationship between the knowledge dimension and the cognitive domain is from Rex Heer at Iowa State University’s Center for Excellence in Learning and Teaching (http://www.celt.iastate.edu/teaching/RevisedBlooms1.html accessed ). It’s an interactive model that articulates the relationship, as Anderson and Krathwohl saw it, rather well. My own interest, as we look to effective ILOs, is to separate out the knowledge dimension as a subject or knowledge domain and have faculty articulate this clearly for students, before reconnecting to the other domains. A process I’ll talk about subsequently. Here are my four ‘working circles’ using adaptations of taxonomies from Anderson and Krathwohl (Knowledge and Understanding, and Cognitive), Krathwohl et al (Affective) and Dave (Psychomotor). I have adapted the Knowledge Dimension of Anderson and Krathwohl to do two things; to describe the dimension in terms of active verbs rather than as a definition of the nature of the knowledge itself, and I have incorporated a stage I believe is under represented in their articulation. I have added the ability to ‘ contextualise’ subject knowledge between the ability to specify it (Factual) and the ability to conceptualize (Conceptual). I have also rearticulated the original ‘Metacognitive’ as the ability to 'Abstract'. This will doubtless need further work. My intent is not to dismiss the valuable work already in evidence around the relationship between a knowledge dimension and the cognitive domain, rather it is to enable faculty, specifically when writing learning outcomes, to identify the subject, discipline or knowledge to be enabled in more meaningful ways. These images are provided as JPG images. If you would like me to email the original PowerPoint slides (very low-tech!) so that you can edit, amend and enhance, I am happy to do so. I only ask that you enhance my practice by sharing your results with me. I hope these provoke thought, reflection and comment. Feel free to use them with colleagues in discussion and let me know if there are enhancements you think would make them more useful to others. The next post will illustrate the usefulness of these visualisations in drafting Intended Learning Outcomes with some examples. Biggs, J. B., & Collis, K. F. (1982). Evaluating the Quality of Learning: Structure of the Observed Learning Outcome Taxonomy. Academic Press Inc.
Boud, D., & Falchikov, N. (2006). Aligning assessment with long‐term learning. Assessment & Evaluation in Higher Education, 31(4), 399–413. Edited October 19th 2012 in response to feedback. The following brief video presentation was prepared for a Course Team workshop at Massey University NZ in May 2010 to introduce the SOLE Model. The SOLE model is intended to be developmental, diagnostic, evaluative and descriptive. It is borne out of a desire to make the learning design process transparent to students, to encourage staff to share ‘patterns’ of learning with each other and to provide a basis for self-evaluation and development of specific learning designs. The model is not concerned with the design of specific learning activities but rather the appropriate balance between the different modes of student engagement anticipated.